Geometric stickers are undoubtedly one of those decorations that can be used to decorate virtually any interior, both domestic and business. Provided you carefully select the pattern and color scheme, of course. 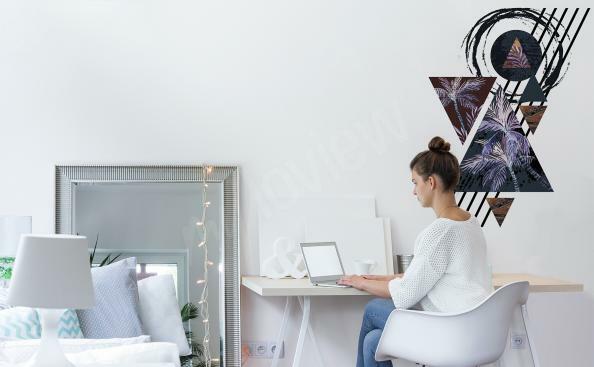 It is worth paying a little attention to this: geometric wall stickers for the wall and many other surfaces are a decoration that is not only very easy to use, but also extremely stylish! In this guide we are presenting a few interesting and hopefully inspiring ideas on how to use geometric shapes in an interior. Even though they are borrowed from serious and rigid mathematics, geometric shapes can look extremely stylish and fashionable – see for yourself! Geometric motifs have been used to decorate interiors and objects since time immemorial. Exquisite lines and shapes can be admired on vases from ancient Greece, among Egyptian hieroglyphs, and on reliefs in the palaces of the Roman aristocracy. It makes you think: how come when we use geometric motifs to decorate an interior, they always look fresh and modern? After all, very similar patterns have been used for – quite literally – thousands of years! In this respect, geometric figures are like flowers: they have always been around, but we'll probably never get bored with them and they will never go out of fashion. They are simply timeless. You can't even talk about "trends" in this case, because how can you refer to something that never really loses its popularity as "trend"? What changes is not the pattern, but the materials and ways in which it is introduced into our homes. Our geometric shapes wall stickers are often decorated with very universal, popular motifs, such as chessboard, spirals, circles and more – but they have been manufactured using modern, high-quality materials and techniques, which take these familiar patterns into the 21st century. 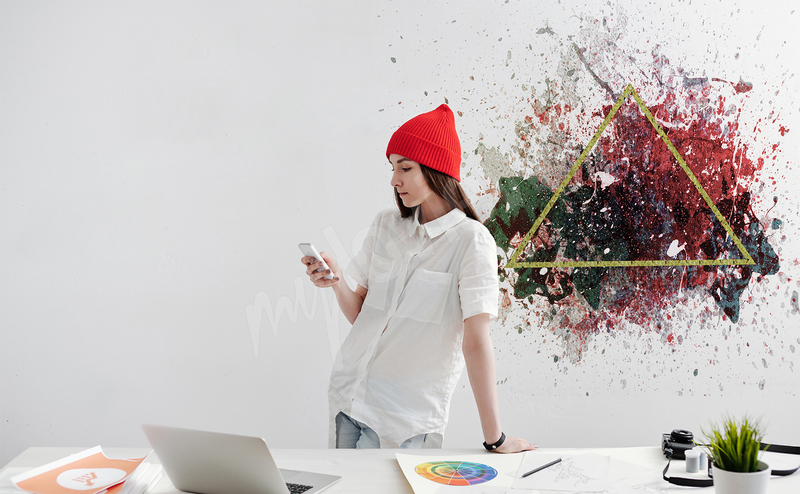 We have prepared some tips for you on how to use geometric shape stickers for the wall and other surfaces to achieve a very fresh and fashionable result. One of the most popular ways to use geometric patterns in an interior are stickers. Geometric shapes in this form can decorate both large and small surfaces (although in the case of very large surfaces we would recommend using a mural, not a sticker) – depending on what effect you want to achieve. Medium- and large-sized geometric shape stickers can replace pictures and posters: simply apply them on the wall where you would normally place other kinds of visual art. This can be particularly useful when decorating a children's room: your little one will not be able to remove the sticker from the wall, so there is no risk of harm coming to them, unlike in the case of framed decorations. We manufacture our stickers exclusively from non-toxic, environmentally safe and odorless materials, which makes them all the more suitable for the children's room. The fridge is undoubtedly the most important kitchen appliance. It is hard to imagine a kitchen without it! It is strange that, although it is indispensable, its appearance usually does not stand out in any particular way. The vast majority of fridges are simply white or silver "cupboards".... It's a pity, because thanks to its large size, this appliance can be very important not only from a practical point of view, but also as an element of kitchen decoration! Geometric stickers for the fridge will turn even the dullest household appliance into a stylish gadget, which will complement the interior design in an interesting way. With the help of the fridge sticker you can match the look and color of this appliance to other elements of the decor (for example by applying a polka dot pattern if the kitchen is decorated in a retro style) or make it stand out from the rest of the furnishings. From an object that is necessary, but not particularly exciting, the fridge will become a fashionable accessory. How to combine geometric patterns with colors? When you choose geometric shapes wall stickers, you have to combine them with a carefully selected color scheme. How to do this so that the result is as stylish and interesting as possible, but doesn't give you a headache? This is the rule of thumb: the more varied the geometric motifs, the more muted and homogeneous the colors should be, and vice versa. Stickers with sophisticated, intricate patterns will look very good even in black and white, while very simple patterns – grids, ornamental strips etc. – may benefit from a variety of interesting colors.